For the first time ever, evidence of a comet storm comes from NASA's Spitzer Space Telescope, whose infrared detectors picked up indications that comets were recently torn to shreds after colliding with a rocky body.. Eta Corvi is the right age, about one billion years old, to experience a bombardment of comets akin to what occurred in our own solar system at 600 to 800 millions years of age, termed the Late Heavy Bombardment. 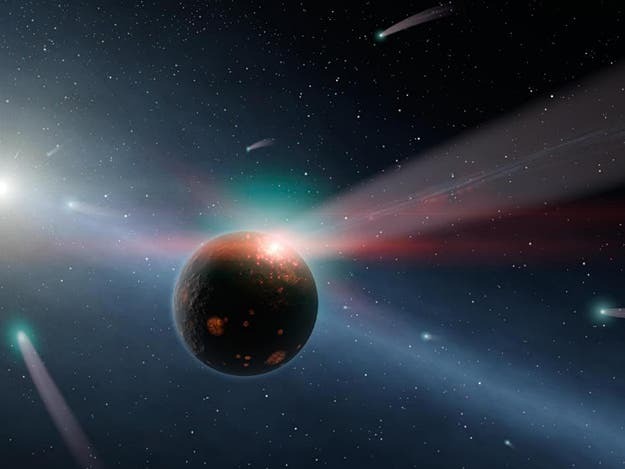 The artist's image aabove illustrates a storm of comets around a star with one giant comet shown smashing into a rocky planet, flinging ice- and carbon-rich dust into space, while also smashing water and organics into the surface of the planet. A glowing red flash captures the moment of impact on the planet. Yellow-white Eta Corvi is shown to the left, with still more comets streaming toward it. Spitzer detected spectral signatures of water ice, organics and rock around Eta Corvi — key ingredients of comets. "We believe we have direct evidence for an ongoing Late Heavy Bombardment in the nearby star system Eta Corvi, occurring about the same time as in our solar system," said Carey Lisse, senior research scientist at the Johns Hopkins University Applied Physics Laboratory in Laurel, Md., and lead author of a paper detailing the findings. Lisse presented the results at the Signposts of Planets meeting at NASA's Goddard Space Flight Center in Greenbelt, Md., today, Oct. 19. Astronomers used Spitzer's infrared detectors to analyze the light coming from the dust around Eta Corvi. Certain chemical fingerprints were observed, including water ice, organics and rock, which indicate a giant comet source. A second, more massive ring of colder dust located at the far edge of the Eta Corvi system seems like the proper environment for a reservoir of cometary bodies. This bright ring, discovered in 2005, looms at about 150 times the distance from Eta Corvi as the Earth is from the sun. Our solar system has a similar region, known as the Kuiper Belt, where icy and rocky leftovers from planet formation linger. The new Spitzer data suggest that the Almahata Sitta meteorite may have originated in our own Kuiper Belt. The Kuiper Belt was home to a vastly greater number of these frozen bodies, collectively dubbed Kuiper Belt objects. About 4 billion years ago, some 600 million years after our solar system formed, scientists think the Kuiper Belt was disturbed by a migration of the gas-giant planets Jupiter and Saturn. This jarring shift in the solar system's gravitational balance scattered the icy bodies in the Kuiper Belt, flinging the vast majority into interstellar space and producing cold dust in the belt. Some Kuiper Belt objects, however, were set on paths that crossed the orbits of the inner planets.The resulting bombardment of comets lasted until 3.8 billion years ago. After comets impacted the side of the moon that faces Earth, magma seeped out of the lunar crust, eventually cooling into dark "seas," or maria. When viewed against the lighter surrounding areas of the lunar surface, those seas form the distinctive "Man in the Moon" visage. Comets also struck Earth or incinerated in the atmosphere, and are thought to have deposited water and carbon on our planet. This period of impacts might have helped life form by delivering its crucial ingredients.